The Alaska Legislature took significant steps toward adjournment on Wednesday with major progress on two key pieces of legislation. With deals nearly in hand on restructuring the Permanent Fund and to bond off the state’s remaining oil tax credit debt, the state’s fiscal plan is starting to fall into place. Just 14 days left in the 121-day session (and a week until the referendum deadline). The restructuring of the Alaska Permanent Fund has–under every plan put forward by legislative leadership or the governor–been expected to be a key piece of the state’s solution to the fiscal crisis since pretty much the start of the fiscal crisis. Legislators have been split over various pieces of the plan, including the size of the dividend and whether or not there should be other parts to the fiscal plan. That’s meant that Senate Bill 26 has sat in conference committee for the entire session after differing versions were passed by the House and Senate. The conference committee met on Wednesday to release their proposed compromise deal that reduces the draw on the permanent fund after a few years and generally leaves the size of the dividend unresolved. 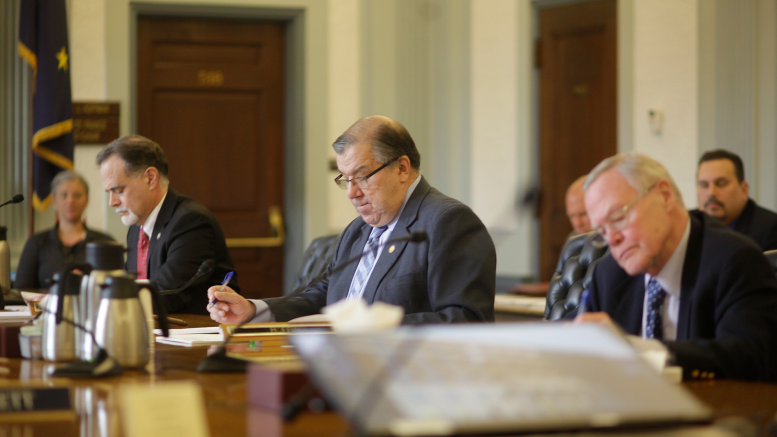 The new version that the conference committee hopes will find support in both the House and Senate sets up a 5.25 percent of market value draw from the Alaska Permanent Fund’s earnings reserve account. That rate will drop to 5 percent in the 2022 fiscal year. The idea behind the draws is that investment returns are expected to outpace the draw, meaning it will grow or at least be sustainable in the long term. Sen. Lyman Hoffman, D-Bethel, told reporters after the hearing that the plan was essentially intended to give structure to the draws from the Alaska Permanent Fund’s earnings reserve account. The Alaska Permanent Fund Corporation has repeatedly warned against the Legislature using ad hoc draws from the account because it hurts its ability to invest. The legislation largely leaves the PFD untouched compared to previous versions of Senate Bill 26 that just completely repealed the existing PFD language. It does change the language surrounding transfers from the permanent fund to the dividend account from the “corporation shall transfer” to “the Legislature may appropropriate,” but the change was proposed more as conforming language to bring the statute in line with the results of Sen. Bill Wielechowski’s legal challenge to Gov. Bill Walker’s 2016 veto of half of the dividend. Meanwhile on Wednesday, the House Finance Committee advanced out House Bill 331. That’s Gov. Bill Walker’s proposal to pay off hundreds of millions of dollars the state owes to oil companies for the now-shuttered oil tax credit system by borrowing bonds. Some legislators have sparred with the administration, arguing that the legislation runs afoul of the Alaska Constitution’s rules on bonding (a point that the Legislature’s legal team agrees could be a problem). The state argues otherwise, and finally released a legal opinion on the issue during the House Finance Committee meeting (but hasn’t been posted online). The optics of the bill are difficult for many legislators as it’s seen as the accumulation of state debt at a time when the Legislature is unable and unwilling (depending on who you ask) to pay out a full dividend. Supporters of the measure see it more as a way to restructure the state’s existing debt, reducing the annual payments to the tune of about $150 million a year by stretching out the term of the debt. Former state economist Ed King, who’s now working as an independent economic adviser, dives into why this might actually pencil out in the state’s favor in a solid explanation to his website. The argument is that essentially cash in-hand and its potential to make money through investment outweighs the additional financing cost of taking out bonds. By keeping the money Alaska does have in investments, the state should come out about $600 million ahead by the time the bonds are paid off. The bill was headed for the floor on Wednesday, but was held over. It should be in second reading today, meaning it could head to a vote as early as Friday. While the Legislature appears to be near to wrapping up session, the Senate is pushing forward with legislation that would institute work (or volunteer) requirements for most able-bodied Medicaid recipients. The Senate Finance Committee balked at the state’s multi-million dollar request for additional positions and worker assistance funding to the tune of about $1,000 per Medicaid recipient. The state argued that because the federal requirements are so high to ensure that Medicaid recipients aren’t worse off under the plan, this sort of funding was the only way to ensure federal approval. The committee had entertained the idea of axing most of the funding altogether, but settled with added intent language that directs the Department of Health and Social Services to work with the Department of Labor to complete an actual review of the 22,000 people who would be affected by the work requirement to assess their needs to get to work. The legislation is now headed to the Senate floor for a vote. Is Senate Bill 63, the smoke-free workplaces bill, scheduled for a vote in the House? 2 Comments on "AKLEG Recap, Day 107: The Legislature’s nearing the end with deals on Permanent Fund restructure, oil tax credits"
What is the “real story” behind the Senate Bill 63, the smoke-free workplaces bill? From what I understand, the ‘real story’ behind the hold up of the overly broad SB 63 is the well informed and wise view of Representative Gabrielle LeDoux . She recognizes clearly the distinction and difference between banning the use of the deadly combustible tobacco products and the newly developing, but far less harmful, businesses in the marijuana and electronic cigarette (vaping) industries. The inclusion of marijuana and vapor products in a blanket prohibition would potentially result in the loss of thousands of Alaskan’s jobs for products that have no relationship to tobacco products that have proven harmful to public health. Electronic cigerettes are actually tobacco smoking cessation devices that help to wean users of combustable tobacco off of the known deadly effects of tobacco, to the far more benign and healthy activity of vaping. As for marijuana, it is now a legal industry here in Alaska that is seeking its way forward. Like consumers of alcohol who indulge for the pleasure and for finding social interaction in public places, such as bars and clubs, so too is marijuana seeking such legal authority to have social places open to the public where consumers of MJ can enjoy their preferred pleasure while socializing with others in designated locations similar to a bar or club. These type developments would be totally prohibited under SB-63 in its original form. This would lump marijuana and vapor products under the rubric of being just like deadly combustible tobacco products, which they are certainly not. I applaud Representative LeDoux for her enlightened recognition of these issues and for holding SB-63 in committee.